Celebrity moms Jennifer Garner, Sarah Jessica Parker, Gwen Stefani, Halle Berry, and Katherine Heigl spent their Mother’s Day weekend out and about with their families. Halle Berry and daughter Nahla spent the day at Coldwater Canyon park. The mother/daughter duo had a picnic and played on the swings and slides together. Jennifer Garner and her colorful cuties, Violet and Seraphina headed to two birthday parties this weekend. One on Saturday (pictured here) and then yesterday they were spotted heading to the birthday party of Tobey Maguire’s son, Otis. Katherine Heigl was snapped at the farmer’s market on Mother’s Day with her husband Josh Kelley and their daughter Nahleigh. Sarah Jessica Parker and Matthew Broderick spent the day at Washington Square Park with their kids James, Marion, and Tabitha. They hung out and listened to music and watched as James played a few games of chess. Gwen Stefani and Gavin Rossdale were spotted in Primrose Hill again this weekend. 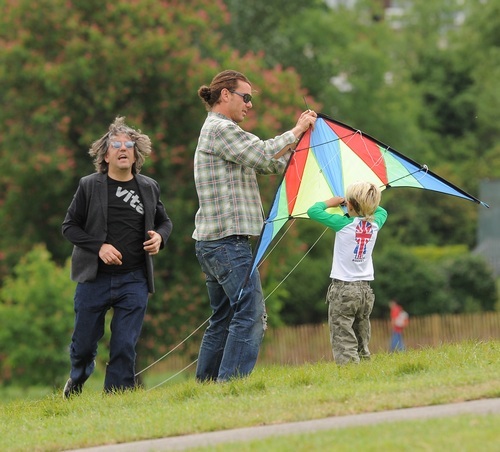 They were photographed flying kites and playing soccer with Kingston and Zuma.